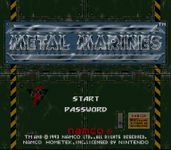 Metal Marines is a real time strategy game set in the year 2117. The objective of the game is to destroy the opposing computer's bases before they can destroy yours. You and your opponent both have an island, or group of islands, where you can build your structures. You can bombard your opponent with missiles or invade with large robotic warriars called Metal Marines. You may build anti-air defenses and Metal Marine defenses, such as gun pods and mines, within your base to protect your structures. Other support structures and upgrades can be built to enhance your economy or functionality of your structures.